It's good to see you again, old friend. I'm looking forward to a few new Portland adventures this weekend and I'm sure you are too. There's an infinite array of things to do and places to see in the Rose City. But where to begin? One of the best parts about traveling to or living in Portland is the accessibility to restaurants serving a vast (metaphorical) buffet of global cuisines with local ingredients. Inspired by those restaurants who aren't afraid to turn up the heat, I've picked my top Portlandia-approved spicy eats from three completely different corners of the globe. We'll travel to SE Division for James Bead award-winning Chef Andy Ricker's authentic Northern Thai cuisine at iconic Pok Pok, over to Alberta Street for Bollywood Theater's funky seasonal interpretations of Indian street food, and then to bohemian taqueria Por Que No on Hawthorne for tacos and margaritas. For adventurous eaters, Pok Pok is the promised land. This iconic Portland restaurant housed in a Thai street-shack inspired bungalow on SE Division helmed by James Beard Award-winning Chef Andy Ricker. 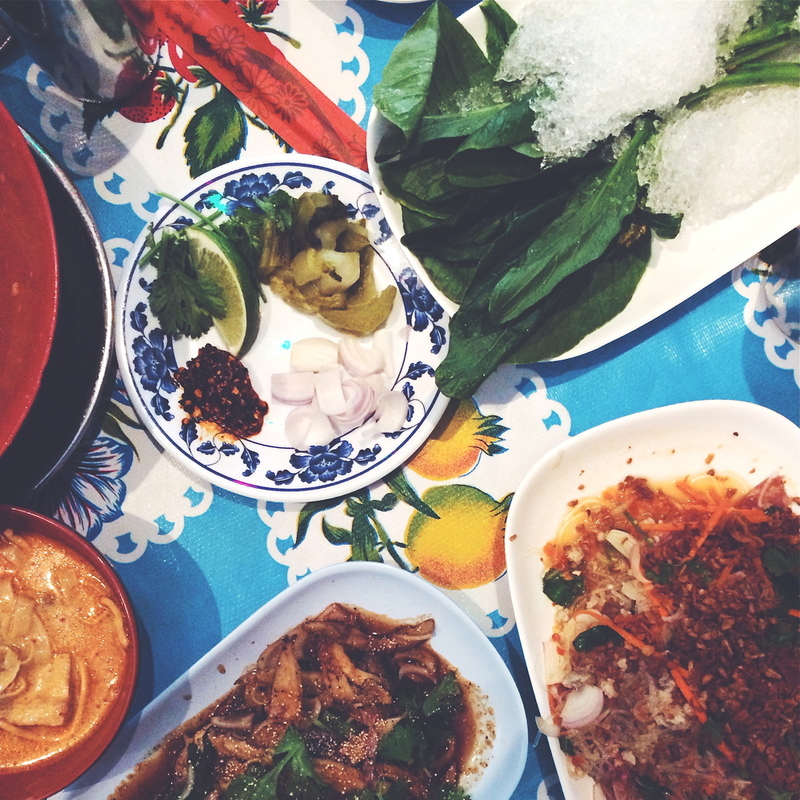 The authentic flavors of the Northern Thai dishes at Pok Pok consistently blow me away. I never order the same thing twice (with one exception being Ike's Vietnamese Fish Sauce wings because they're incredible) and I always love every single dish. When ordering at Pok Pok, be sure to ask the server for advice for a selection of dishes that best complement each other and let him or her know how spicy you are willing to try. The wait for a table can be a bit of a marathon during peak hours. Offer to sit at the bar (if in a small party of 2-3) and cut wait time by 20 minutes or so. Need a little inspiration before you go? Check out this episode with Chef Andy Ricker and Anthony Bourdain taking to the streets of Thailand in CNN's Parts Unknown. What to order: The (in)famously spicy Ike's Vietnamese Fish Sauce Wings to start, whatever the server recommends, and a seasonal, house-made Som drinking vinegar. Curry and company at Bollywood Theater. Bollywood Theater is Portland's unique take on Indian food with an eclectic, fun atmosphere. Black and white Bollywood films play in the background while Kati rolls, curries, and thirst-quenching cocktails are shared with friends. While both Bollywood Theater locations are equally delicious and consistent, the Division location also contains a small Indian market with specialty spices and other cooking basics. Bollywood Theater is one of my all time favorite rainy weather meals. There's just something about the lively yet relaxed atmosphere, the old Bollywood Films, and a hot plate of vada pav that always spices up a rainy day. What to order: Vada pav and a craft cocktail of choice to cool it all down. It's fiesta time with Lengua and Al Pastor tacos at Por Que No. So, what happens when you walk into one of Portland's all-time favorite taquerias and ask for the two spiciest tacos on the menu? After a brief behind-the-counter huddle, a server emerged with, "Al Pastor and Lengua. You're cool with tongue, right?" I assured them that I was a gamer and ordered the two alongside a strawberry-ginger Agua Fresca for good measure. There's a reason why Por Que No is the longstanding hot spot that it is; the tacos and margaritas don't kid around. With funky, gritty SE Hawthorne setting the mood, this bohemian taqueria doesn't pull any punches when it comes to flavor. I've yet to taste a taco or a margarita at Por Que No that I didn't like. That being said, if you're looking for the spice factor then the Al Pastor is definitely one to order. Hey, some like it hot. What to order: The Al Pastor tacos and a margarita to kick back with on the back patio.